Story: Braddock was a US soldier fighting in Vietnam. During his tour of duty he met the girl Lin Tan Cang whom he married . Braddock was captured by the NVA and held prisoner for 8 months and for some reason declared MIA for seven years . Exactly when this happened was not revealed but for the chronology to fit, it must have been in 1975. His imprisonment was well described , but the rest of his time in Vietnam during the war is sketchy . When Saigon fell in 1975 and the US army had to leave, Lin Tan Cang was believed to be dead and left behind. When Braddock found out that she was alive, he went back to Vietnam to get her out. He was too late. She died shortly after his arrival, leaving Braddock with a son he didn't know he had . While trying to rescue his son, Braddock discovered that MIA's wasn't the only thing left behind by the US army. Orphaned children of Vietnamese women and American G.I. 's needed to be rescued too, which he did . Skills & abilities: James Braddock is trained in warfare and strategy and is a master of both weapons and hand-to-hand combat. Background notes: In the early eighties, the Vietnam War had become distant enough in the American memory to be interesting for Hollywood. 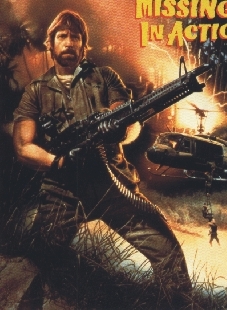 Like Rambo from the First Blood movies, Col. Braddock was a veteran from 'Nam who went back in to find American POWs still held captive by the Vietnamese. Where Rambo was the over-the-top superhero soldier who would go into Vietnam, rescue American POWs, blow everything up, and kill some nasty commie Russians while being there, Braddock was a down-to-earth soldier who would go in, free the POWs and get a little revenge. In mid to late eighties when the more serious Vietnam War movies came out, Rambo continued gaining fame and became a household name, while Braddock faded into oblivion. It could be argued that both First Blood and Missing in Action is just lowbrow entertainment, but the focus on the Vietnam War paved the way for a generation of serious movies about the Vietnam War like Platoon, Full Metal Jacket and Casualties of War.